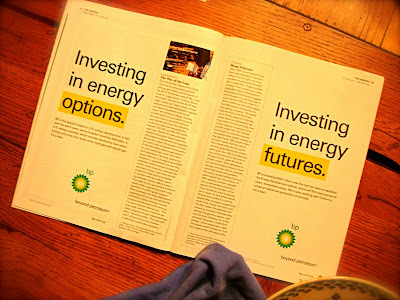 It’s been seven years since BP launched a $200 million rebranding campaign with Ogilvy to turn the world’s 3rd largest oil concern into “Beyond Petroleum,” an eco-friendy, consumer-listening, solar-powered investor that is much more than an oil company. As you’d expect, such claims from an oil behemoth — founded in 1998 by the merger of British Petroleum and Amoco — were met with some derision at first. But BP took a green-and-gold sun as its logo, quickly won PRWeek’s “campaign of the year,” and now — seven years later — the campaign is still going strong. We think it’s brilliant. Here’s why. 1. BP’s media plan and creative are unwavering. Over 86 months, we’ve seen the same logo, the same brand position, the same yellow highlighted text, the same targeting of higher income consumers (think “investors”) in magazines such as The Atlantic. BP is consistent. It tells the world it is more than oil; it is the friendly environment + future energy. Think about the frequency of impressions. After seven years, you can’t help but begin to believe some of it. 2. BP’s advertising covers every angle. 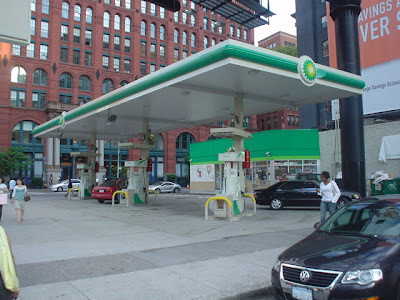 Gas stations in the U.S. were modernized with the green and gold. The very gasoline itself was rebranded, with the middle-grade gas now called “Silver” at BP stations. From the road, the point of sale is inviting, challenging Mobil’s convenience stores-Speedpass-and-clean-bathrooms for busy travelers. 3. It’s ballsy. Come on. Changing the very name from British Petroleum — which sounds aspirational to the U.S. consumers who admire the uppercrust UK — to Beyond Petroleum. Doing so left its core product, oil, behind. Imagine selling that idea to YOUR board. 4. This is so looooong term. The world of oil energy is changing. Heating oil manufacturers in the U.S. are just beginning to toy with 5% grades of bio-diesel, and here in 2001 we have the third-biggest oil conglomerate walking away from its core to focus on solar power and clean energy. Now in 2007, with Al Gore in the news, investors looking toward the Northwest Passage, and Russia planting a flag on the seabed of the North Pole to stake a claim on ocean rights when the ice up there is gone, BP got a jump on the others by recognizing the long-term trend in the market. We need more energy, and we’re looking ahead. And now, we Americans can still feel good about oil. BP, BP. How could you be so smart?